Andrew Sullivan has a post up today demonstrating that while it did not affect the outcome, two pollsters — Fox and Rasmussen (essentially the propaganda wings of the Republican party) — skewed Republican support by 3-4% throughout the entire election cycle by not including any cell phone-only users in their data at any point. That’s why we saw numbers like these in amalgamated poll results: Republicans, 50%; Democrats 41%. The actual numbers were 49% and 43%. But Fox and Rasmussen were providing the GOP with ludicrous 13% leads, and that tilted all of the data heavily in the party’s direction. And it can’t be that they didn’t know what they were doing — they were outliers the entire time and they knew what the effect on polling averages would be. Now, again, it didn’t affect the outcome directly, but the Dems nevertheless had more support than was registered — and, by no coincidence — among the demographic Republicans fear most and have a self-interest to exclude: young, urban, liberal. There’s also a cynical self-fulfilling prophecy about all of this; if people think an election’s a forgone conclusion (which of course is what Fox was screaming at the top of its lungs for weeks on end), then the so-called “enthusiasm gap” (also shrieked about endlessly) may be fed until it is feeding itself. The point is that this is a familiar Republican trick: voter caging — to keep, by whatever means possible, either directly or indirectly, Democrats away from the polls. And it is, moreover, enabled by a lazy and incompetent mainstream news media which prefers “narratives” to facts. 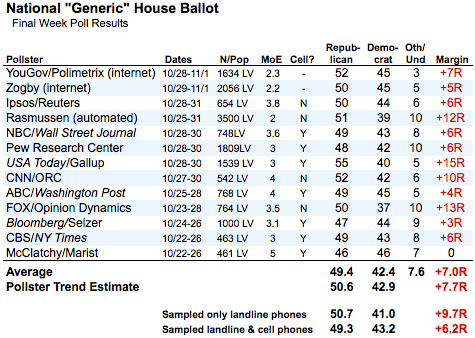 At the very least, it demonstrates that pollsters must now make a point of polling cell phone-only users. If they do not, they are effectively staking the Republicans an advantage every time that does not actually represent voter intent — which of course makes pollsters not only useless, but dangerous to the democratic process.